Congratulations to Daquita & Jason. They had a beautiful ceremony yesterday at the Charles Mack Citizen Center in Mooresville, NC. 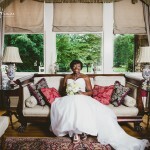 Their wedding photos are not ready but here is a photo from Daquita’s bridal session at the Van Landingham Estate. Happy Anniversary To Mr. & Mrs. Robinson !! !